Exchange your old empty 2.5 or 5 gallon gas can for a free, brand new, environmentally friendly can of equal size! UCAIR and Chevron are exchanging over 4,500 gas cans. That’s equivalent to eliminating 540 cars off Utah’s roads per day over the 5-year life of each gas can. Making this small change can have large impact on our air quality. Together we can make a difference in Utah’s air quality. The Gas Can Exchange Program will be the first of its kind in Utah and help our state come into compliance with the EPA standard. Permeation of vapors through walls of containers. Escaping fumes while fuel is being dispensed. Spillage and over filling as fuel is being poured into equipment. Spillage and evaporation through secondary vent holes. Evaporation through inadequately capped spouts. Automatic shut-off feature to prevent overfilling. Sealed when it is not in use. Protects children from accidental spills and ingestion. Secondary venting holes are eliminated to stop venting of fumes into the air. Thicker walls to reduce vapor permeation. 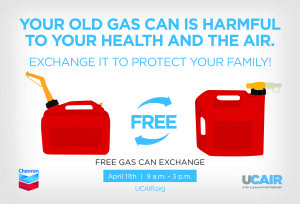 Please contact Angie at coordinator@ucair.org if you have any questions about the gas can exchange. Salt Lake City Green is excited to announce that we are a recipient of a Utah Clean Air Partnership (UCAIR) grant to refresh our outreach and engagement efforts for the City’s Idle Free Ordinance! When Salt Lake City passed the Idle Free Ordinance in late 2011, a concerted effort to engage local businesses and the community to educate about the new ordinance and place idle free signs at key locations throughout the city was undertaken. Air quality is a top priority for Mayor Becker and the residents of Salt Lake City and the time is right to refresh our education and engagement efforts. As we head into inversion season, Salt Lake City is thrilled to receive the generous grant from UCAIR, which will allow us to refresh our materials (website, handout, signs) and engage once again with the local business community and community at large to make sure everyone understands the benefits of being idle free, the limitations of the ordinance and how they can have a positive impact on our air quality by simply turning their key! Look for more information soon at SLCgov.com/idlefree. In the meantime, please let us know if you have any questions about the ordinance. If you would like to report an idling complaint in real time, please call (801) 535-6628. A Salt Lake City compliance officer will be dispatched to investigate. During the warmest summer months, Salt Lake City experiences poor air quality due to ozone pollution. 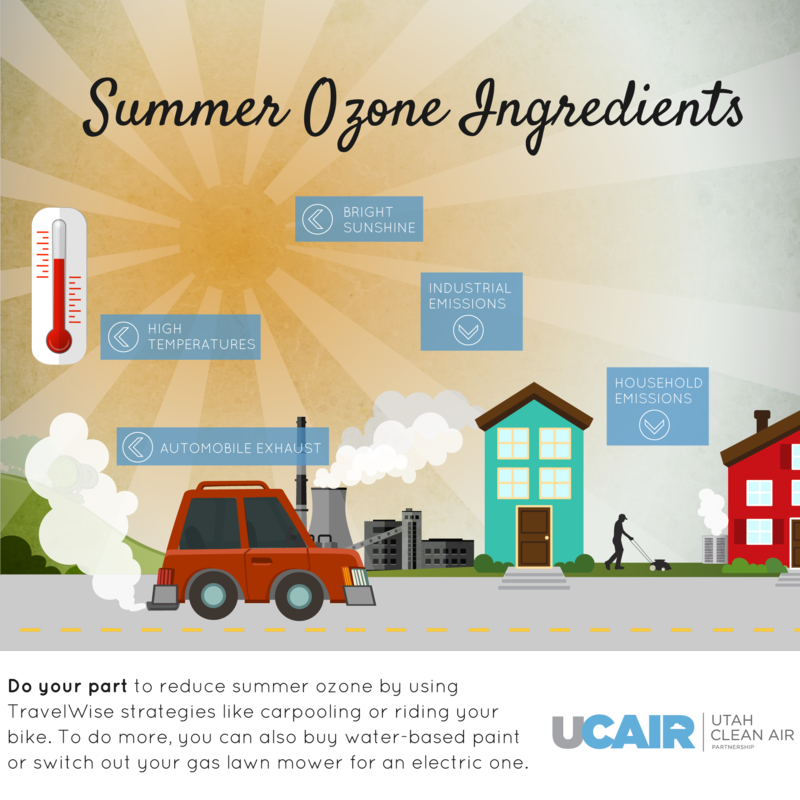 This helpful graphic from the Utah Clean Air Partnership – UCAIR outlines how ozone is formed, and what we can do to reduce our impact. Salt Lake City Mayor Ralph Becker, Cody Steward, Governor Herbert’s Energy Advisor and Ted Wilson, Director of UCAIR announce the installation of two new fast charging electric vehicle stations. Today Mayor Ralph Becker joined representatives from the Utah Office of Energy Development (OED) and the Utah Clean Air Partnership (UCAIR) to announce new Salt Lake City infrastructure that supports electric vehicles (EVs) and air quality goals in the region. Salt Lake City’s two new fast-charge stations, donated by Nissan to OED, are among the first of their kind in Utah. OED provided the stations to the City, along with one previously granted to Salt Lake County, as part of an inter-local agreement signed in early 2014. OED and UCAIR then partnered to cover the cost of installing the units. The 480-volt stations can provide a significant charge to the typical electric vehicle in less than an hour. “The Office of Energy Development was pleased to partner with the City, UCAIR and Nissan on this exciting project,” said Cody Stewart, Energy Advisor to Governor Gary R. Herbert. “It’s important to note that these new charging stations are just one aspect of how electric vehicles are receiving a boost in Utah. Bills passed during the 2014 legislative session enhanced tax credits for EVs, bolstered the state’s fleet of cleaner vehicles and allowed organizations to sell electricity from EV charging stations.” These changes resulted in Utah improving its grade from a B- to a B+ in the 2014 EV Report Card (details here). In addition to the new fast-charge stations, the City has upgraded its existing public charging infrastructure. Low-voltage EV charging stations were originally added at five locations in 2011 and these stations were recently upgraded to higher voltage units (locations in link below). These new Level 2 stations will allow users to charge their vehicles in about a third of the time. As with the original low voltage stations, these upgraded Level 2 units will remain free for public use. Parking for EV users will be free, for up to two hours, at all charging stations. However, the City Council is expected to review a proposed fee schedule for electricity at the two fast-charge locations. Fees would help cover costs for monitoring and maintaining the stations, in addition to electricity charges. More information on the City’s new fast-charge and enhanced Level 2 charging stations can be found at SLCgov.com. 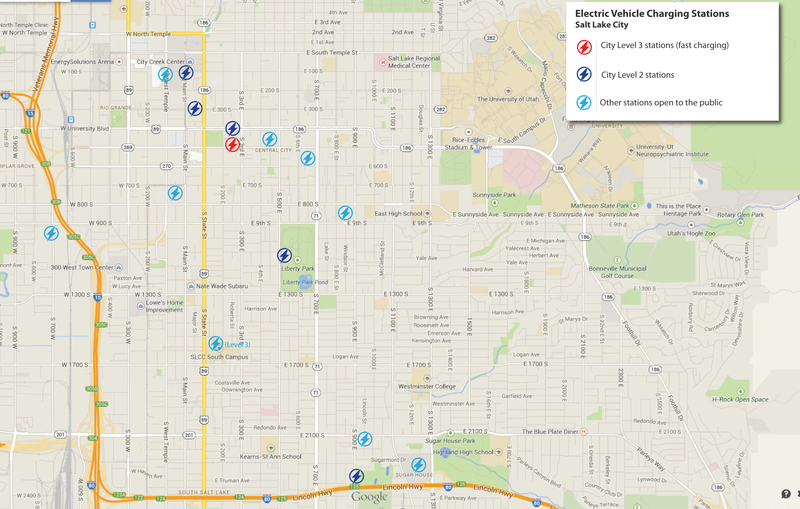 Map of charging stations located in Salt Lake City. 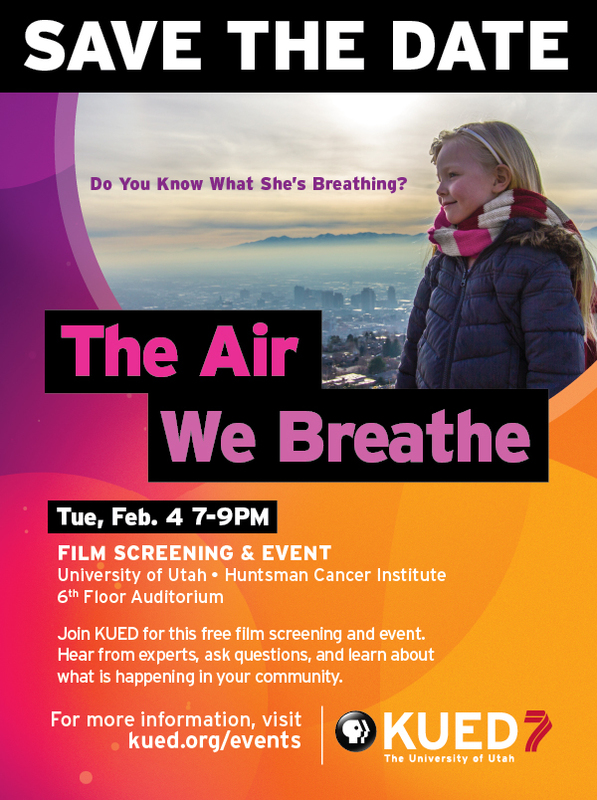 The free community event begins with a preview of “The Air We Breathe,” a locally-produced, 30 minute documentary that examines Utah’s air quality. Attendees will also hear from Robert Grow, Executive Director of Envision Utah, and have a Q&A with University of Utah Program for Air Quality, Health & Society Director Dr. Robert Paine. SLCgreen will be there, and we hope you will too! Are you dreaming of warmer days and bluer skies? So are we! SLCgreen was recently awarded a grant from the Utah Clean Air Partnership (UCAIR) to fund our SmartTrips 2014 neighborhood! Even though it is hazy and cold outside, we’re moving full speed ahead with some exciting plans for 2014. The newly launched SmartTripsSLC Instagram is making a splashy debut, hosting a series of images from the new neighborhood. Take a peek and see if you can #guesswhere in SLC! Stay tuned for the neighborhood announcement and a new SmartTrips SLC blog chock full of awesome content. In the meantime, see if you can guess the new SmartTrips 2014 neighborhood from the images below! The Utah Clean Air Partnership (more commonly known as UCAIR) is now accepting proposals for their new grants program. The purpose of the program is to provide incentives to the private sector, government entities, and individuals to reduce emissions of criteria pollutants that cause Utah’s poor air quality. Grants will be used to promote investment by the private and public sector in emission-reducing technology, lower emission vehicles, energy efficiency and other proven methodologies for reducing or eliminating emissions, including education of the public. The program will also encourage creative thinking and promote the development of new technology, but will be based on solid metrics and performance standards that demonstrate actual emissions reductions. A loan program will be announced at a later date. Visit the UCAIR website for more information, and to download the application form.